Located slightly off Launceston City, but is walkable distance – very close to the Cataract Gorge Reserve. We arrived for lunch at 12pm, and were excited to try as we heard good things about it. Interior was well furbished and felt very warm and comfortable overlooking the relaxing still waters through the window. We ordered Launceston’s Kombucha – Avocado Moon Lemon Myrtle & Lemon Grass. The waitress were so tentative that they served us two glasses with ice to share. J ordered Tasmanian salmon, cauliflower, vadouvan, labna, toasted seeds, $36. Although their portions looked small at first sight, but it was enough for us in the end. The salmon was cooked very well – crispy skin on top and the cauliflower was roasted to soft. The taste of it was delicious with the smoked flavour from the roast. I ordered a rather asian inspired dish – Clams, green tea soba noodles, XO butter, wakame, $28. Clams cooked in XO butter was beautiful. It was strong in flavours and the wakame brought back the sea origin to the dish. I liked how it added the crispiness after searching through meat from the hard shell clams. The soba noodles were mild but a bit too soft for my liking. I usually have al dente soba noodles so I felt it was a bit overcooked. J found the texture of the soba noodles fine. It depends on everyone’s preference I guess and it was the only flaw I had. From the above, I was going to rate them 4/5. Just because the soba noodles weren’t as al dente and they charged us for $2.50 each for bread. The waiter asked if we would like bread and J said yes assuming it was complimentary. Unfortunately, we had only realised upon settling the bill. $5 was quite dear for us knowing that the butter was not anything extravagant. Sourdough crust was also very hard. It was a Saturday night that we arrived with no bookings – everywhere else was fully booked until after 7pm. We were lucky to secure a table for two. We were dressed in hiking gear and as we were walking in, I was afraid we would have been judged by our horrible dress code. I thought wrong, the attitude from the staff were friendly. Consistent with lunch! Upon arrival they asked us if we have been to Still Water before, and we said – only for lunch. It turns out dinner is slightly different, so she explained the menu and what they do/don’t have. Loved it. 5 stars to service. Funny enough bread was complimentary for dinner. It was warmed up with a thicker slice and better butter compared with lunch. I felt I was at a different restaurant! Torched white fish, fermented apple & dill, garlic cream, $24 – we were advised that the white fish was king fish, so we had to pick it because we love king fish. Lightly torched and the fennel and apple jus was light but citrus-sy. The garlic cream was dropped on each slice of fish. It was the right amount when we put it in our mouth. I had a taste of the jus and felt that they added white wine. We both enjoyed the jus – kept scooping the jus even though there was no fish left! We both gravitated towards the Southern calamari, squid ink angel hair, shellfish bisque, $26. 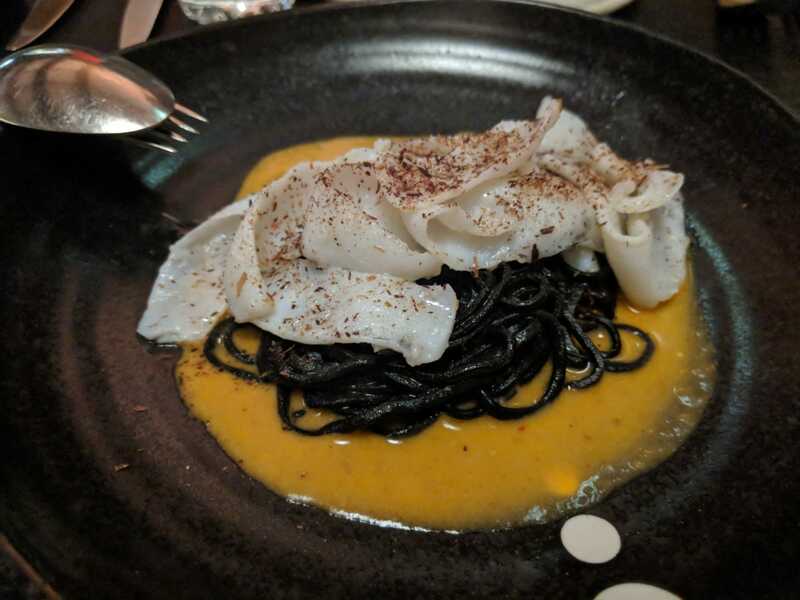 It was divine… calamari was soft and thinly sliced, I didn’t need to chew because it was so soft… We tossed the squid ink angel hair with the bisque and it created a creamy texture coating on the pasta. It was delicious and I could have more of it! A little sad that it’s only their small plate menu and not part of their mains. Entree was superb and I thought main wouldn’t be able to top what we have tasted so far, but I was wrong again! Free-range Nichols chicken (1⁄2 bird) twice cooked, garlic & black sesame dressing, pickled cucumber & Korean chilli sauce, $60. Twice cooked chicken was delicious… skin was crispy, the breast was very moist and falls off the bone. The garlic and black sesame dressing was the star to make this dish ‘divine”. I tasted a bit of ginger in the sauce. J and I still talk about this chicken. The pickled cucumber had thin shreds of ginger, it was a good side dish to freshen the taste from the hearty meal. The chicken dipped with the Korean chilli sauce brought out the sweet and tanginess to each bite. It could be dipped with or without. Both brings out different flavours. The chilli sauce was not chilli for me. So I am 100% happy! We didn’t have room for dessert, although there were some great fresh flavours I wanted to try. The waitress then came back with two petits made by the chef – his interpretation of ferrero rocher – nutty but with dark chocolate. Yum.